(PhysOrg.com) -- Images of a martian landscape offer evidence that the Red Planets surface not only can shake like the surface of Earth, but has done so relatively recently. If marsquakes do indeed take place, said the scientists who analyzed the high-resolution images, our nearest planetary neighbor may still have active volcanism, which could help create conditions for liquid water. Gerald Roberts, an earthquake geologist with Birkbeck, an institution of the University of London, who led the study, said that the images of Mars included boulders that ranged from two to 20 meters (6.5 to 65 feet) in diameter, which had fallen in avalanches from cliffs. The size and number of boulders decreased over a radius of 100 kilometers (62 miles) centered at a point along the Cerberus Fossae faults. This is consistent with the hypothesis that boulders had been mobilized by ground-shaking, and that the severity of the ground-shaking decreased away from the epicenters of marsquakes, Roberts said. The team compared the pattern of boulder falls, and faulting of the martian surface, with those seen after a 2009 earthquake near LAquila, in central Italy. In that event, boulder falls occurred up to approximately 50 km (31 miles) from the epicenter. Because the area of displaced boulders in the marsscape stretched across an area approximately 200 km124-miles) long, the quakes were likely to have had a magnitude greater than 7, the researchers estimated. 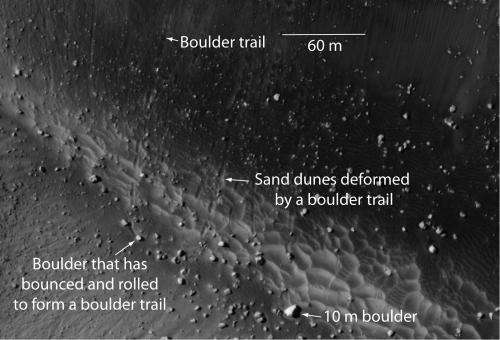 By looking at the tracks that the falling boulders had left on the dust-covered martian surface, the team determined that the marsquakes were relatively recent  and certainly within the last few percent of the planets history  because martian winds had not yet erased the boulder tracks. Trails on Mars can quickly disappear  for instance, tracks left by NASA robotic rovers are erased within a few years by martian winds, whereas other, sheltered tracks stick around longer. It is possible, the scientists concluded, that large-magnitude quake activity is still occurring on Mars.